It is FairyTale Friday, a weekly meme I co-host with Literary Transgressions. All bloggers are invited to link up their fairy tale posts here. Everyone can join in by commenting. 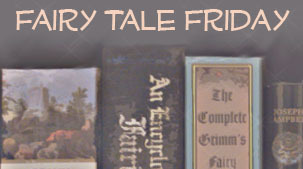 Also, see the FairyTale Friday July Giveaway. This week I am highlighting Susan Jeffers who has illustrated dozens of books. She often partners with author Amy Ehrlich on fairy tale retellings. 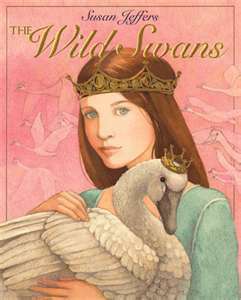 The Wild Swans and The Snow Queen are lesser known tales from Han Christian Andersen’s nineteenth century collection. These stories have a few things in common. First, they do not offer idealistic Disney versions of life. In both, the protagonists endure real hardships. The people they encounter are often evil like the robbers who threaten to slit a girl’s throat, a child who enjoys watching animals suffer, and lamias clawing the Earth with long bony fingers! Of course, early fairy tales did include such evils and much worst! Furthermore, despite a few minor scary references, both protagonists are admirable. They suffer great hardships, even risking their own lives, to save people they love. Positive character qualities abound, such as determination, goodness, innocence, self-discipline, self-sacrifice, and perseverance. These qualities appear to be important to the people of the nineteenth century since they are so often found in early fairy tale collections. Finally, Susan Jeffers’ illustrations brilliantly capture the original era they were written in with intricate details as well as vivid colors contrasting with neutrals shades. 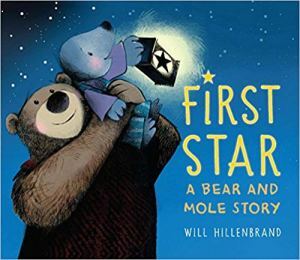 I love her realistic portrayals of the characters and settings with large, captivating illustrations, adding a wonderful layer to the stories. Kai and Gerda are next-door neighbors and bosom friends. After a brief encounter with the Snow Queen one late winter’s night, Kai changes. He becomes mean and distant. The following winter he wishes to show off in front of the other boys by tying his sled to a cart traveling by. Rather than freeing himself after a short ride, he becomes entranced by its driver: The Snow Queen. Kai disappears from the village. All believe he died in the nearby frozen river. Gerda doesn’t though. She goes on a great quest in search of her beloved friend where she visits an old woman who enchants her into staying, a king and queen who provide her with supplies, and a group a robbers who take everything. Nothing dissuades her from her search. 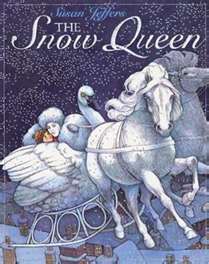 The mighty Snow Queen is no match for Gerda, whose love, goodness, and innocence easily break the spell enslaving Kai. In a far away kingdom, a king lives in a palace with his 11 sons and 1 daughter. The children have an idyllic life. After some years have passed, the king marries a wicked woman who hates the children. She sends the daughter, Elise, to live with some farmers. The princes are condemned to live as wild swans, uttering strange and mournful cries while wandering through the skies. When Elise turns 15 years old, she returns to the castle. The queen is threatened by her beauty and goodness, so she once again successfully banishes her. Elise goes in search of her beloved brothers. When she finds them, they travel to a distant land together. While there, she learns how to break the spell on her brothers, but it requires her to overcome physical and emotional hardships. Not only that, Elise is not able to utter a word until the task is complete which becomes even more challenging when she is condemned to death for something she did not do. Her love for her family and her perseverance, help her overcome and break the spell. I would love to hear about your experience with Jeffers' work or tell about your favorite lesser known fairy tale. All comments are welcomed. The Snow Queen is my favorite fairy tale of all time, but I've never read this version--looks great, especially the illustrations! When my children were young I enjoyed reading them The Three Jovial Huntsman, my alltime fav Jeffers book, with incredible illustrations that she had to color separate herself, before the days of scanners. Thanks for stopping by SC and Douglas. I always love to hear what others think about the topics/books I write about here. I have never heard of The Three Jovial Huntsman, but I will check it out. These books look great! I don't think I have read any retellings by this duo- but I like that they are more realistic versions and the artwork looks excellent. I enjoy all fairy tales- but my favorite is The Twelve Dancing Princesses.